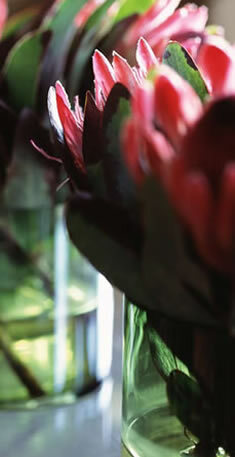 Here the quirky interior design makes little attempt to reflect the natural landscape. 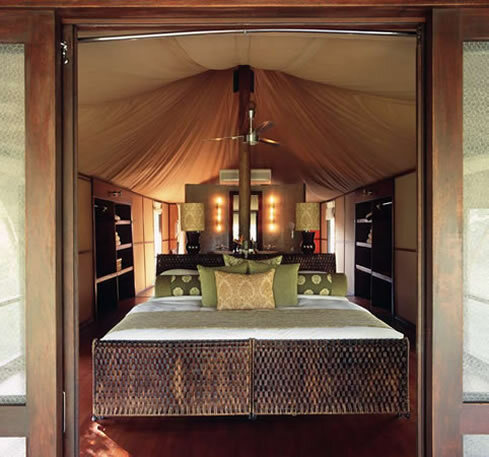 Instead, all the obvious clich�s have been avoided without forfeiting comfort, luxury or the tented-safari experience in any way. 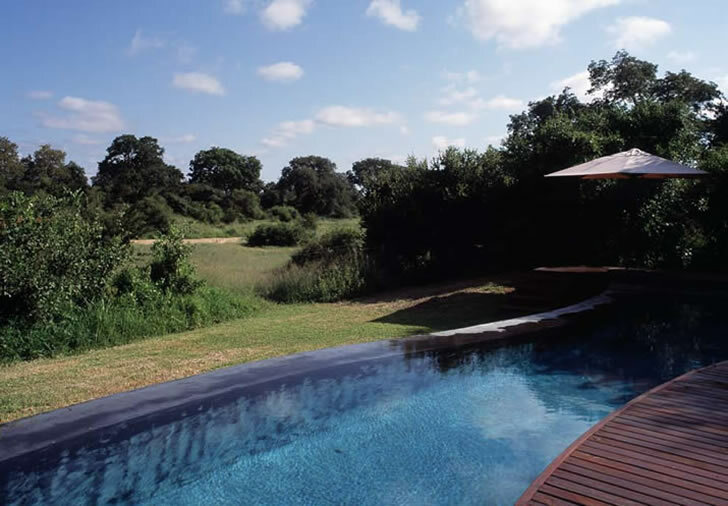 Three kilometres from the Kruger National Park�s Orpen Gate, in a dense thicket of jackalberry trees, a surprise awaits. 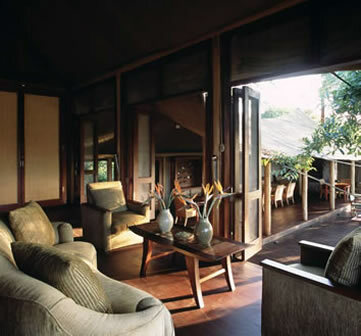 Ngala Tented Camp remains true to its name by including six tented suites on raised platforms, but the accommodation also offers a sophisticated update on the tented-safari decor concept by merging modern Scandinavian elements with surprising accents of colour and retro memorabilia. The camp takes all its cues from the seasonal Timbavati river. Whether dry or full, the Timbavati provides the daily spectacle for guests, who can watch game wander by from elevated timber viewing decks or take a cooling dip in the lap pool with its contours that echo those of the riverbank. The camp�s structures have been designed to both conceal themselves in the environment and reveal its beauty. A large communal building faces the riverbank and features various viewing decks and a curvaceous infinity pool. Areas are defined by their levels: an intimate sitting room is suspended on top and looks out on the vistas below, a dining room takes up the middle level and the camp�s shop and kitchen are set on the lowest. The individual en suite canvas tents stand on raised saligna-wood platforms; each is supported by a central column and perimeter ring beam. These go beyond their obvious structural function of keeping the tents upright, lending them a sharply tailored architectural profile. 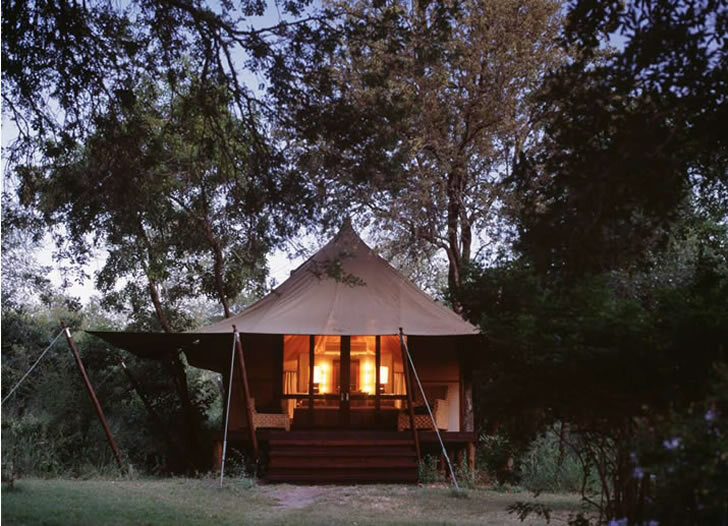 �We aimed to introduce a more contemporary canvas vernacular that was fresh and new, as opposed to the classic safari-tent look,� says Browne. The clean, modern lines of the structures meant that Browne could �play a bit� (in his words) by introducing organic furniture shapes and a few kitsch, retro pieces. 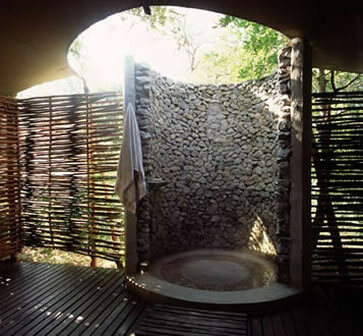 The element of surprise underlies Browne�s architectural and design approach throughout and is also reflected in the use of dry-packed Phalaborwa stone to construct rustic feature walls in the bathrooms and open-air showers of the tents. Unexpected flashes of acid green � �it sounds incongruous in the bush but the location and retro feel I was going for made it the obvious choice of colour,� explains Browne � create a connection between the public spaces and the private havens of the bedrooms as well as adding a glamorous richness. The interiors throughout have the restraint of contemporary Scandinavian minimalism but are made approachable by the presence of printed silks, chenilles, woven wicker, leather and other textured ingredients. In the bedrooms a less-is-more approach has been taken, with the bed taking centre stage. The ultimate surprise, however, is to be found in the nostalgic memorabilia and objets that pay tribute to the Kruger Park�s past. Dinky cars, collectible Kruger Park teaspoons set in resin, mosaic pictures above the bar, agate stones mounted on the walls and curiostyle soapstone carvings are all intended to provoke nostalgic delight and hark back to the park as it was in the 1960s and 1970s.